Google+ has always been the social media that I'd heard about, but was never quite sure what it was. This week, I decided to explore it, and I ended up finding a vibrant space full of useful resources, strategies, and ideas for teachers. The idea of Google+ is to join communities of topics that interest you or to follow other people. I chose to join several communities created by teachers to share ideas and resources for their classrooms. Teachers Helping Teachers. is a community to give strategies, tips, and ideas for teachers from other teachers. They have their space organized into several categories like "New to Teaching", "Co-Teaching", "In Over My Head!!! ", and "Curriculum Links." I especially liked the "Tips and Strategies" category because it gave miscellaneous advice about classroom organization, teaching styles, and how to stay motivated. Each post will typically contain either text or a link to what that person wants to show the group. For example, one teacher wanted to show the group how to help our students attain deeper learning instead of just skimming material. She included a link that led to this fun infographic. 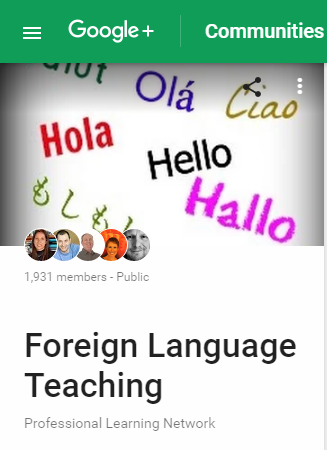 Another community that I enjoyed becoming a part of was the Foreign Language Teaching community. They offer resources for over 9 different languages, including Arabic, Mandarin, Italian, German, Spanish, and Portuguese. They also have categories for professional development and using technology with foreign language instruction. Something that I found really interesting was how some teachers were using it to coordinate Skype chats with other classes across the nation and with other countries to practice the target language. I think this is something that could really bring the idea of the pen pal into the 21st century and aid students in gaining valuable speaking skills. 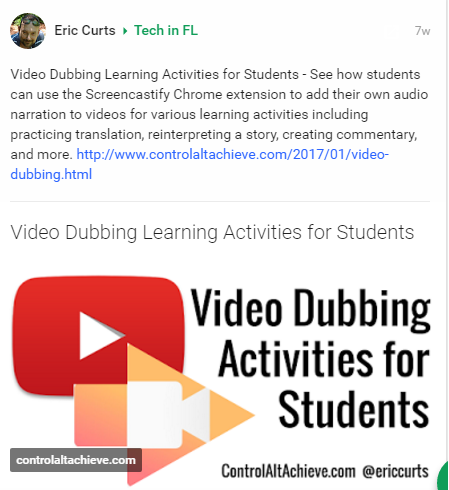 However, I think my favorite post was the one explaining how to use video dubbing as a fun project for students. It uses a Chrome extension to allow students to add audio overlay and practice translation and comprehension skills. Having a Google+ account not only gives you access to great resources, but it also lets you create Google Hangouts, a tool that lets up to 10 people share a virtual "room" and communicate through video. It is a good way to encourage collaboration and also makes sure the teacher can monitor the "room." With all sorts of apps and add-ons, this tool can become so much more than just a large video chat. I can't wait to utilize these resources in my own classroom, perhaps by creating a community for my own classroom that the students can add to, or by chatting with a class in Spain to give valuable cultural and interpersonal exchange - the possibilities are endless!